Map scale description: Scale [ca. 1:2110]. 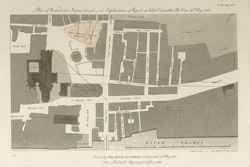 The printing of this plan was ordered by the House of Commons. It highlights an available premises on Princess Street in orange. Intersecting lines run from Whitehall Chapel to Westminster Abbey, indicating plans to widen the road. This area housed one of the worst tenement complexes (or 'rookeries') in London, something partly attributable to the custom of giving sanctuary to criminals within the abbey precints and the surrounding area. Broad Sanctuary St survives to this day as a testimony to this history. The widening of roads in the area and the construction of Victoria Street from 1845 to 51 resulted in the demolition of much of the rookery.